10k race number collection and entries on the day are at the Jaguar Sports and Social Club, Browns Lane, Allesley, Coventry, CV5 9DR. Fun Run number collection and entries on the day are at the Scout Hut in Washbrook Lane, Allesley, Coventry, CV5 9FG. Changing and shower facilities are at the Jaguar Sports and Social Club. Results, presentations and refreshments are at the Scout Hut in Washbrook Lane. These two venues are approximately 600m apart, and both lie close to the A45 which skirts the south of the city. The 10km race and children’s Fun Run are based in Allesley on the western outskirts of Coventry. The nearest railway station is Coventry, which is about 3 miles from Browns Lane. From the station it is an approx 10 minute taxi ride. Alternatively; take the bus to Pool Meadow Bus Station and then a number X1 bus (from stand H – Birmingham) bus to Neale Avenue, Allesley. The Jaguar Sports & Social Club (10k race number collection) is approximately 800 metres walk. The X1 bus takes about 11 mins and runs every half hour on Sundays. There is a number 7 bus which stops opposite the Jaguar Sports & Social Club, and there are Sunday services that arrive before the start of the 10k race. Check the availability of trains and buses before making arrangements as these are subject to change at weekends. From Northwest M6 – Leave motorway at junction 4. Take A446 towards Coventry. At roundabout, take A45 towards Coventry. Travel about 6 miles, leave A45 at junction with A4114 (Allesley/Coventry). 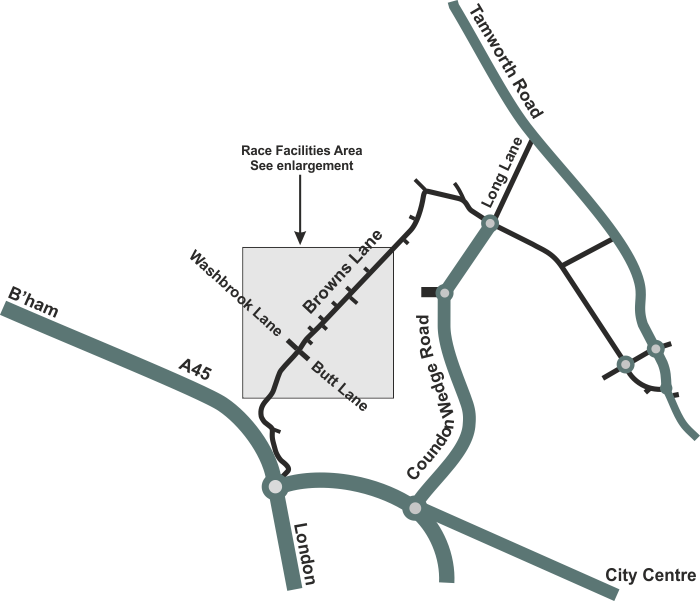 At bottom of slip road take first exit from roundabout (Rye Hill – Windmill Hill – Browns Lane). From Northeast M1 – Leave motorway at junction 21. Take M69 towards Coventry. At end of motorway continue onto A46 and then onto A45 (direction Birmingham). Leave A45 at junction with A4114 (Allesley/Coventry). At bottom of slip road take first exit from roundabout (Rye Hill – Windmill Hill – Browns Lane). From Southwest M5/M42 – Leave M42 at Junction 6. Take A45 towards Coventry. Travel about 7 miles then leave A45 at junction with A4114 (Allesley/Coventry). At bottom of slip road take first exit from roundabout (Rye Hill – Windmill Hill – Browns Lane). From Northeast M1/M69 – At the end of M69 continue onto A46. Stay on A46 and continue onto A45 (Birmingham). Leave A45 at junction with A4114 (Allesley/Coventry). At bottom of slip road take third exit from roundabout (Rye Hill – Windmill Hill – Browns Lane). From Southeast M1/M45/A45 or M40/A46/A45 – in both cases take A45 towards Birmingham. Leave A45 at junction with A4114 (Allesley/Coventry). At bottom of slip road take third exit from roundabout (Rye Hill – Windmill Hill – Browns Lane). 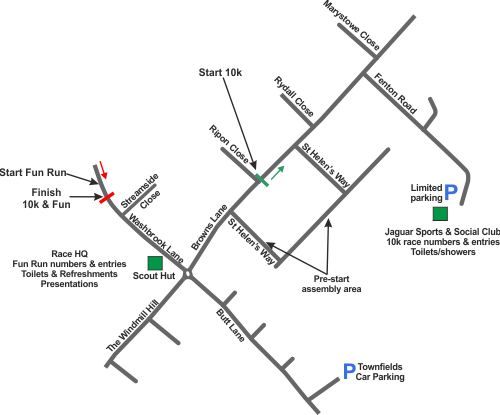 Alternatively – use Sat-Nav; CV5 9DR for the Jaguar Sports and Social Club, or CV5 9FG for the Scout Hut.